The long months of planning by SHAEF, its predecessors, and the subordinate commands culminated on 6 June in the great assault. Shortly before midnight, 5 June, elements of a British and two U.S. airborne divisions took to the air from various fields in southern England and headed for the Cotentin peninsula and for points east of the Orne River. (Map 1) Already mine sweepers of the Eastern and Western Task Forces were clearing ship lanes to the selected beaches--UTAH and OMAHA for the U.S. forces, and GOLD, JUNO, and SWORD for the British. On their way to a rendezvous point south of the Isle of Wight were five naval forces; two additional follow-up forces were loaded and at sea. Aboard the craft of Admiral Ramsay's task force of more than 5,000 vessels were elements of three U.S., two British, and one Canadian divisions. Overhead the bombers and fighters were starting a day's offensive which was to see nearly 11,000 sorties and the dropping of nearly 12,000 tons of bombs. Meanwhile, the Supreme Commander and General Montgomery waited in their advance headquarters at Portsmouth for the first news of the landings. General Eisenhower, having stayed with elements of the 101st Airborne Division at their camp near Newbury until near midnight, returned to his camp to await news of the landings. For the moment, control of the battle had passed from his hands. Despite all the difficulties, the troops had got ashore, mostly in good condition. Only fragmentary reports of the landing drifted back to SHAEF advance headquarters at Portsmouth, where the Supreme Commander fretted for lack of news. Indications that both airborne and infantry losses along the fifty-mile front were lighter than expected were encouraging, but this bright aspect did not make up for the fact that the forces in the center had gone only 1,500 to 2,000 yards inland and were in no position to meet the enemy armored counterattack which the OVERLORD planners anticipated by D plus 3. The marshy land at the eastern neck of the Cherbourg peninsula and hard-fighting enemy elements still lay between the Allied center and right. In view of the difficulties in the Allied center, Eisenhower became particularly concerned with speeding up the junction of the two U.S. beachheads. On 7 June, accompanied by Admiral Ramsay and members of the SHAEF staff, he viewed the invasion front from the mine layer Apollo and conferred on board at various times during the day with Generals Montgomery and Bradley, and Rear Admirals Alan G. Kirk, John L. Hall, and Sir Philip L. Vian. A decision was made in the course of the day to give special attention at once to closing the Carentan-Isigny gap between VII and V Corps. Eisenhower ordered the tactical plan changed to give priority to that task,4 and the entire 101st Airborne Division was directed against Carentan while the V Corps continued its planned expansion east, west, and south. Carentan fell on 12 June and the corps link-up was solidified during the next two days. The VII Corps at the same time pushed north to Quinéville and across the Merderet River. On the central front concentric drives by U.S. and British forces by 8 ,June had closed the initial gap at the Drome River between the V and 30 British Corps. The V Corps then pushed through the bocage country to within a few miles of St. Lô before grinding to a halt in the face of stiffening enemy defense and increasing terrain obstacles. The 1 British Corps in the meantime was struggling slowly toward Caen. The Germans, considering Caen the gateway to Paris, massed their reserves to defend it and stopped the British short of the city. By the end of the first week of the invasion, Eisenhower's forces had consolidated a bridgehead eight to twelve miles deep extending in a rough arc from points just east of the Orne on the east to Quinéville in the north. and Arromanches-les-Bains. 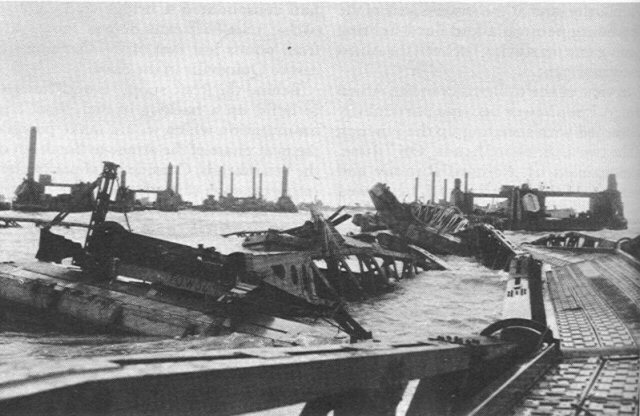 The task of putting these harbors into operation was fraught with great difficulties: craft and matériel had to be towed across the Channel, the ships that were to act as breakwaters had to be sunk so as to provide maximum protection for shipping, and the piers had to be anchored so as to withstand wind and tides. The British proved to be more successful with their breakwater at Arromanches than did the U.S. forces on OMAHA Beach. Although the British moved more slowly, they had their harbor more securely placed when a heavy gale struck the Channel in the period of 19-22 June and destroyed much of the U.S. MULBERRY. Virtually no unloading took place for forty-eight hours. So complete was the destruction that a decision was made to discontinue the building of the U.S. MULBERRY. Some parts were salvaged for the artificial harbor at Arromanches. More damaging still to German unified command was the ground force situation. The German theater headquarters in the west (Netherlands, Belgium, and France) since late 1940 was OB WEST. The Commander in Chief West was concurrently the commander in chief of Army Group D and as such exercised command over the ground forces in the theater: Armed Forces Commander Netherlands; Fifteenth, Seventh, First, and, since August 1943, Nineteenth Armies. Rundstedt's control had been encroached upon at the end of 1943 when the energetic and able Generalfeldmarschall Erwin Rommel, commanding the Army Group for Special Employment and directly subordinate to OKW, came to the west. Rommel had been made responsible for the inspection of all coastal defenses in the west and ordered to prepare specific plans to repel Allied landings in this area. His headquarters was also earmarked as a reserve command to conduct the principal battle in case of an invasion. 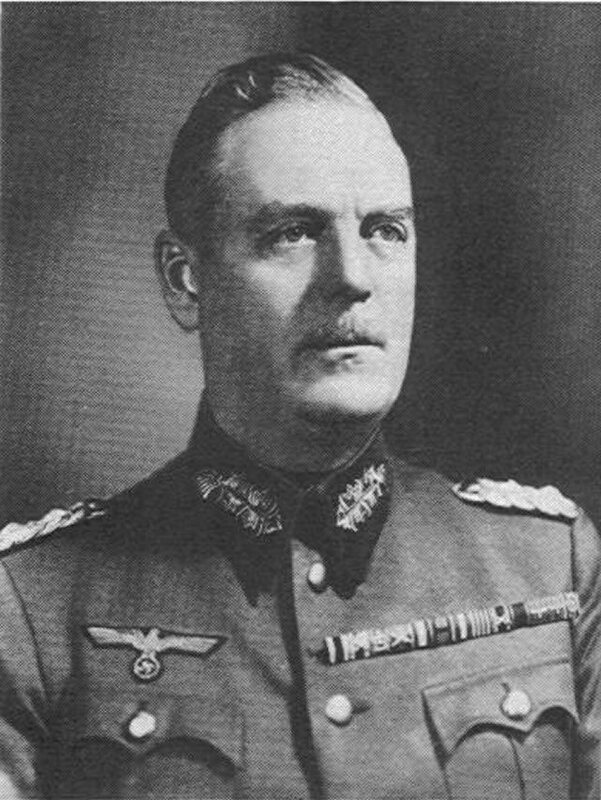 His direct subordination to OKW was terminated by mutual agreement between Rundstedt and Rommel in early January 1944. Rommel's headquarters was redesignated as Army Group B, and he was, in his capacity as the anti-invasion commander, given tactical command over the German forces in northwestern France, Belgium, and the Netherlands. However, Rommel retained his former inspection functions for the coastal defenses and so remained in a position to influence over-all policy. GHQ artillery in the west, and some control over the German armies in southwestern France and on the Mediterranean coast. 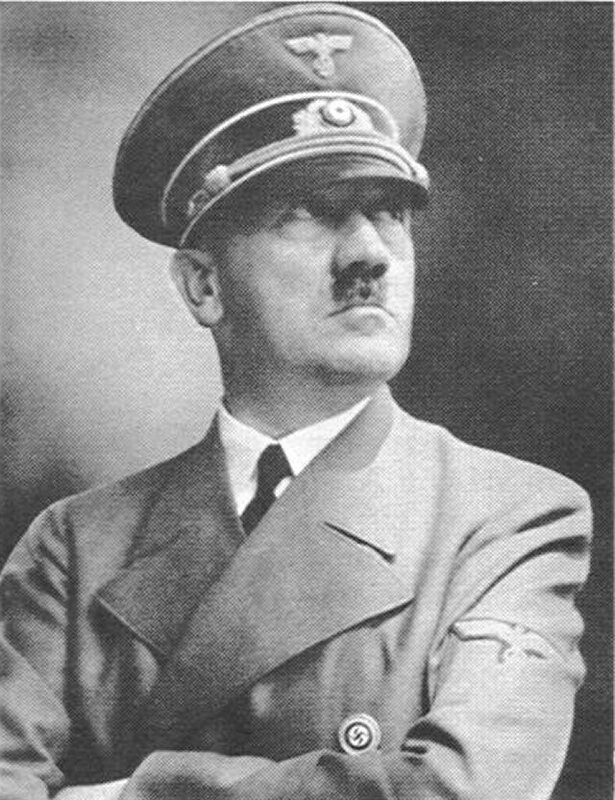 However, after further study of the effect of these powers upon the command in the west, Hitler reversed his opinion and canceled the extra powers given Rommel. 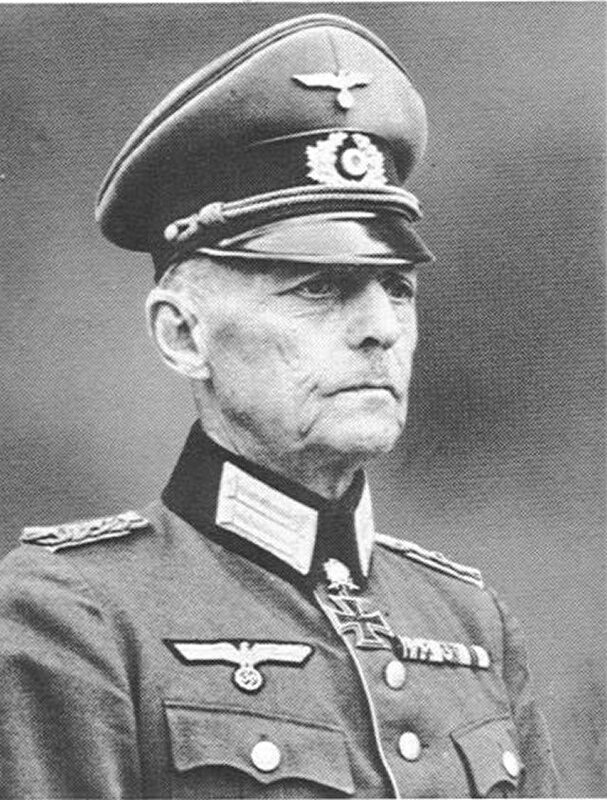 In May of 1944, Rundstedt, in an effort to make clear his status as theater commander and to counterbalance Rommel's position, established Army Group G under Generaloberst Johannes Blaskowitz to command the German forces in southwestern France and on the Mediterranean coast. In spite of this move and in spite of his nominally subordinate position, Rommel retained a disproportionate influence in the west until after the invasion. and by Rundstedt's efforts to hold something back. Rundstedt in November 1943 set up Panzer Group West (General der Panzertruppen Leo Freiherr Geyr von Schweppenburg) to control armored units in any large-scale counterattack against Allied landings. 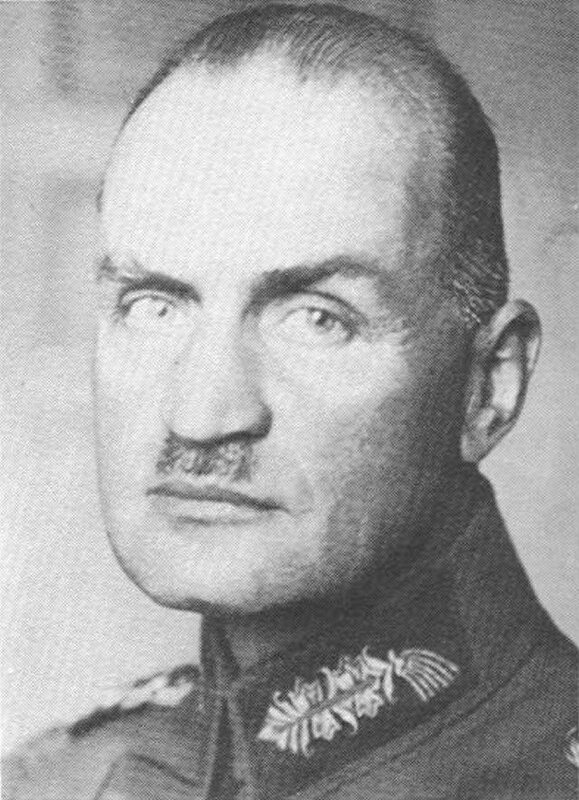 Geyr's stanch support of Rundstedt's views on defense made impossible co-operation with Rommel on the employment of armored forces against a landing. While Rommel in the spring of 1944 was unsuccessful in gaining complete control of all armored and motorized units in the west, he nonetheless achieved a partial victory when three panzer divisions were assigned to him as Army Group B reserves. Like many other arrangements of the period, this assignment was somewhat complicated, since Geyr retained the responsibility for the training and organization of the units, while Rommel had tactical control. The latter's position was further confused when four panzer-type divisions were set aside as a central mobile reserve under the direct command of OKW. Thus D Day found an uneasy arrangement between Rundstedt and Rommel in which neither had real control and in which the policy of defense against Allied landings was undetermined. In the assault area proper, which was almost in its entirety under Seventh Army's jurisdiction, the enemy had seven infantry divisions.10 One panzer division had been brought forward to Caen and some elements were on the coast in that area. In Brittany, besides the three static divisions, there were three infantry and one parachute divisions. An additional parachute division was in process of being organized. The nearest armor reserves were all south or east of the British left flank. One panzer division was in the area of Evreux, another south of Chartres, and a third was astride the Seine between Paris and Rouen. Other reinforcements had to come from south of the Loire or from the Pas-de-Calais area. despite a speed-up in the delivery of tanks in the spring of 1944, lacked half of their heavier armored weapons. With confusion of authority in the German command, lack of an agreed policy for dealing with the Allies, a mistaken notion that the attack of 6 June was perhaps not the main one, lack of air support, supply difficulties, and troops who showed either the strain of too many campaigns on many fronts or the softness and carelessness promoted by four years of static duty on the Atlantic coast, the enemy was ill prepared to meet the massive blow which the Allies unleashed by land, sea, and air. On the side of the enemy lay the advantage of fixed positions, however incomplete, against forces landing from small craft, interior supply lines, knowledge of the terrain, hedgerows which were of enormous value to the defender, and years of experience. Time would show that the advantages favored the invading forces, but there were enough factors on the side of the enemy to enable him to make a tough fight in the beachhead. Commander felt he had to place control of day-to-day actions in the hands of one man. Under plans of campaigns approved by General Eisenhower, General Montgomery held responsibility for the co-ordination of ground operations, including such matters as timing the attacks, fixing local objectives, and establishing boundaries. Until the lodgment area could be firmly held, the Allied armies were to operate under the OVERLORD plan which had been outlined before D Day. peninsula and then thrust northward through Valognes to Cherbourg. As a second priority, the First Army was to send other units from their positions east of Carentan southward toward St. Lô to secure the high ground east of the Vire which dominated the town. Montgomery hoped that Caen and Cherbourg would be taken by 24 June.17 The order of 18 June was changed the following day, and the strong attack planned on the left wing against Caen was shifted to the right, southeast of Caen. The operations were postponed from 18 to 22 June. The great gale forced another postponement to the 25th. The German armored divisions, although superior to British and U.S. armored units in numbers, had been badly battered in the June fighting. Suffering from the shortage of fuel and the breakdown of tank maintenance service brought about by Allied air and artillery operations, they were unable to bring their whole strength to bear. Nevertheless, the enemy forces waged a savage fight. against the Allies, was holding most of its divisions in place. The Allies had continued since D Day to play on German fears of another landing. A special effort had been made to persuade the Germans that General Patton was waiting with a group of armies in eastern England ready for an attack. Various ruses were used to heighten German apprehensions concerning the Kanalkueste. When General Patton went to the Continent as commander of the Third U.S. Army and it became necessary to commit the 1st U.S. Army Group to action, the unit was renamed 12th Army Group, and a paper unit was left in the United Kingdom. Lt. Gen. Lesley J. McNair was appointed commander of the 1st Army Group in July. The successful culmination of the Cherbourg campaign found neither the battle for Caen nor the attack toward St. Lô progressing well. Heavy concentrations of German armor helped slow British forces to the east; hedgerows of the bocage country slowed the advance of the British right wing and the entire U.S. army. Tanks were confined for the most part to narrow roads bordered by hedges which afforded excellent cover to the German guns, and the infantry had to dig out an enemy entrenched in the hedgerows of hundreds of tiny orchards in the Calvados countryside. Heavy rains interfered with air reconnaissance and virtually stopped tactical air attacks. As the struggle for St. Lô bogged down in a slow and costly fight, the danger developed that an attritional battle such as the Allies had fought in Flanders in World War I might be imminent. To have no setbacks or reverses. It was not always too easy to comply with these two fundamental principles, especially during the period when we were not too strong ourselves and were trying to build up our strength. But that period is now over, and we can now set about the enemy--and are doing so. We must get the Brittany Peninsula. . . .
We do not want to get hemmed in to a relatively small area; we must have space--for manoeuvre, for administration, and for airfields. We want to engage the enemy in battle, to write-off his troops, and generally to kill Germans. Exactly where we do this does not matter, so long as (a) and (b) are complied with. The first thing we had to do was to capture Cherbourg. I wanted Caen too, but we could not manage both at the same time and it was clear to me that the enemy would resist fiercely in the Caen sector. So I laid plans to develop operations towards the R. Odon on the Second Army front, designed to draw the enemy reserves on to the British sector so that the First U.S. Army could get to do its business in the west all the easier. We were greatly hampered by very bad weather. . . . But this offensive did draw a great deal on it; and I then gave instructions to the First Army to get on quickly with its offensive southwards on the western flank. . . . The First Army advance on the right has been slower than I thought would be the case; the country is terribly close, the weather has been atrocious, and certain enemy reserves have been brought in against it. So I then decided to set my eastern flank alight, and to put the wind up the enemy by seizing Caen and getting bridgeheads over the Orne; this action would, indirectly, help the business going on over on the western flank. These operations by Second Army on the eastern flank began today; they are going very well; they aim at securing Caen and at getting our eastern flank on the Orne River--with bridgeheads over it. Having got our eastern flank on the Orne, I shall then organize the operations on the eastern flank so that our affairs on the western flank can be got on with the quicker. It may be the best proposition is for the Second Army to continue its effort, and to drive southwards with its left flank on the Orne; or it may be a good proposition for it to cross the Orne and establish itself on the Falaise road. Alternatively, having got Caen and established the eastern flank on the Orne, it may be best for Second Army to take over all the Caumont area--and to the west of it--and thus release some of Bradley's divisions for the southward "drive" on the western flank. Day to day events in the next few days will show which is best. The attack of Second Army towards Caen, which is going on now, is a big show; so far only 1 Corps is engaged; 8 Corps takes up the running on Monday morning (10 July). I shall put everything into it. It is all part of the bigger tactical plan, and it is all in accordance with para 4 above. On 10 July, the 21 Army Group commander issued orders for the coming Allied offensive. He directed the First Army to push its right wing strongly southward, to pivot on its left, and to swing south and east on the general line Le Bé-Bocage-Vire-Mortain-Fougères. Once it reached the base of the Cotentin peninsula, it was to send a corps into Brittany, directed on Rennes and St. Malo. 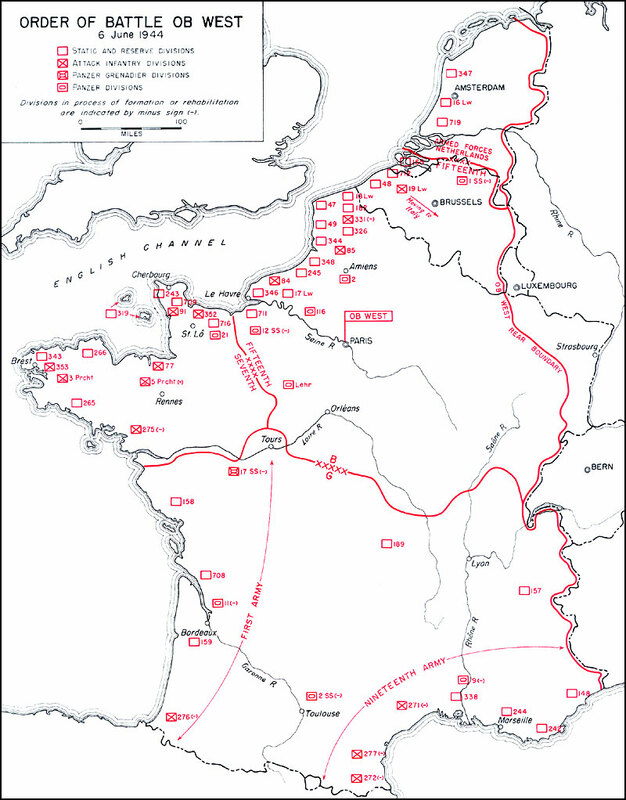 Meanwhile, plans were to be made for the second phase of the drive in which First Army's strong right wing was to make a wide sweep of the bocage country toward Laval-Mayenne and Le Mans-Alençon. The press did not know of these orders. Newsmen in the week preceding the attack stressed the fact that the crucial blow for the breakout from the lodgment area was to be struck near Caen. Some of General Montgomery's chief advisers have suggested that misconceptions as to the 21 Army Group commander's objectives perhaps arose from the overemphasis he placed on the decisiveness of the operation in order to insure full air support for the operation. Strategic bomber commanders did not like to take their planes off strategic targets for limited offensives. The tendency, therefore, was for the ground commander to stress heavily the importance of the attack he wanted supported. This emphasis may be seen in Montgomery's request to Eisenhower of 12 July. With respect to the plan, I am confident that it will reap a harvest from all the sowing you have been doing during the past weeks. With our whole front acting aggressively against the enemy so that he is pinned to the ground, O'Connor's [Lt. Gen. Sir Richard O'Connor, 8 British Corps commander] plunge into his vitals will be decisive. I am not discounting the difficulties, nor the initial losses, but in this case I am viewing the prospects with the most tremendous optimism and enthusiasm. I would not be at all surprised to see you gaining a victory that will make some of the "old classics" look like a skirmish between patrols. General Eisenhower's assurances, which might have been essential had the impasse in Normandy continued, were proved to be unnecessary by the turn of events. As his words were written, the Allied forces were on the move--toward Falaise in the east and toward Brittany in the west. The frustrations and irritations, born of inaction and stalemate, which had stirred the Allied press to criticism, were to evaporate, at least for a time, as the Allied forces burst through the German lines and swept toward Paris. 1. Brigadier E. T. Williams, former chief of intelligence of 21 Army Group, says (letter to author, 1 August 1951) that there was some conjecture as to the probability of its being there, but no definite proof. 2. V Corps lost some 2,000 dead, wounded, and missing, as opposed to VII Corps' 200. The 82d and 101st Airborne Divisions lost approximately 2,500. Harrison, Cross-Channel Attack, pp. 284, 300, 331; [Roland G. Ruppenthal] Utah Beach to Cherbourg, AMERICAN FORCES IN ACTION (Washington, 1947), p. 55. 3. Detailed accounts of the D-Day story are given in Harrison, Cross-Channel Attack, Ch. VIII; Ruppenthal, Utah Beach to Cherbourg; Charles H. Taylor] Omaha Beachhead, AMERICAN FORCES IN ACTION (Washington, 1945); Montgomery, Normandy to the Baltic, Ch. VIII; Stacey, The Canadian Army, Ch. XI. 4. Eisenhower to Marshall, SCAF 48, 8 Jun 44, Eisenhower personal file. 5. British statistics are from COSINTREP 36 (statistics for 18 June 44), 20 Jun 44, SHAEF AG 370, 2/11; U.S. statistics from [Clifford L. Jones] NEPTUNE: Training for and Mounting the Operation, and the Artificial Ports (The Administrative and Logistical History of the ETO, Pt. VI), MS, II, 175n, OCMH. COSINTREP 36 shows a figure of 307,439 men for U.S. forces as opposed to the Jones figure. 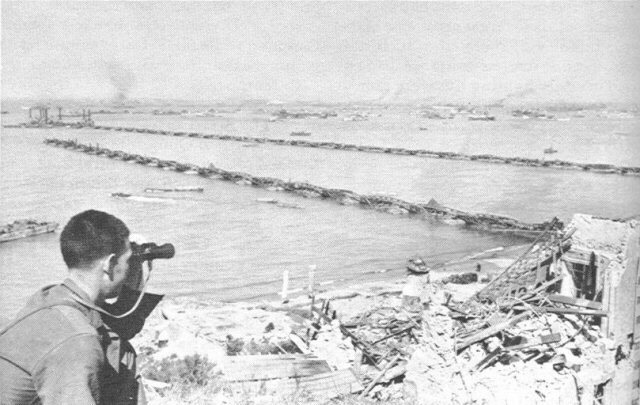 Jones's figures were based on daily reports of unloadings submitted by the engineer special brigades on OMAHA and UTAH Beaches. The nature and validity of the various reports are discussed in Ruppenthal. Logistical Support of the Armies. 6. The organizational structure and evolution of OKW and OKH have been described in great detail by committees of German officers working under the auspices of the Historical Division between 1946 and 1948. See MSS # T-101, The German Armed Forces High Command (Winter et al.) and # T-111, The German Army High Command (Halder et al.). See also Harrison, Cross-Channel Attack, Ch. IV. 7. Harrison, Cross-Channel Attack, Chs. IV and VII, has detailed information on the enemy. As in that volume, the term Commander in Chief West will be used here to refer to the person holding the title Oberbefehlshaber West, while the abbreviated form OB WEST will refer to his headquarters. 8. Static divisions were immobile defense divisions. They were designed as permanent garrison troops for the west. 9. Rommel's forces included: Seventh Army (Generaloberst Friedrich Dollmann), which held Brittany and a substantial part of Normandy; Fifteenth Army (Generaloberst Hans van Salmuth), which held the Kanalkueste (the coastal area from Dunkerque to the Seine estuary); and, for tactical purposes, Armed Forces Commander Netherlands (General der Luftwaffe Friedrich Christiansen). Blaskowitz' command included First Army (General der Infanterie Kurt von der Chevallerie), which held the Atlantic coast of France south of Brittany, and Nineteenth Army (General der Infanterie Georg von Sodenstern), which held the French Mediterranean coast. 10. The 319th Division stationed on the Channel Islands never figured in any of the fighting. Because of Hitler's orders, the Germans could not even consider it as a reserve. It will therefore not be included in any calculations of Seventh Army's strength. 11. The term, "Pas-de-Calais," as used in this volume, applies to the coast line washed by the Strait of Dover between Dunkerque and the Somme. 12. The estimate was approximately 80 divisions, 10 of which were believed to be airborne. The United States had 20 divisions in the United Kingdom on D Day; British and Canadian forces numbered 18. Not until near the end of the war did the Allied force surpass the German estimate. 13. Memo, Command and Organization after D Day OVERLORD, 1 Jun 44, SHAEF G-3 322.011-1. Command and Control of U.S./British Forces. 14. See below, pages 203-04, for some changes during the month of August. 15. An excellent summary of the command arrangements during the weeks of the assault and the reasons for the setup are given in Msg, Eisenhower to Marshall, CPA 9-0230, 19 Aug 44, Eisenhower personal file. 16. Montgomery, Normandy to the Baltic, pp. 85-91. 17. Montgomery dir to comdrs, M-502, 18 Jun 44, FUSA files 21 A Gp dirs. 18. Ruppenthal. Utah Beach to Cherbourg, p. 199. 19. Montgomery, Normandy to the Baltic, pp. 100-101. 20. There were twelve and one-half divisions (including three armored and one airborne) plus seven independent armored brigades and three independent infantry brigades, or approximately sixteen divisions according to British Historical Section estimates. 21. Actually nine divisions were listed, but of three of these there were only remnants. First U.S. Army estimated that their combined strength was "probably . . . only one full strength infantry division." At the end of June, moreover, First Army declared that only a "battle group" each from the 265th and 275th Divisions (included in the total) had reached its front. Some forces of the 2d Panzer Division were active in late June on the extreme left flank of the U.S. line. Montgomery, Normandy to the Baltic, pp. 102-06; FUSA Rpt of Opns, pp. 91-92. Throughout this and the following chapter the author has relied heavily on a study of German units made by Mrs. Magna E. Bauer of the Foreign Studies Branch, OCMH. 22. Air Chief Marshal Leigh-Mallory was a notable exception. 23. Brief Summary of Operation Overlord as Affecting the Army, address to officers in the four field armies in London, 7 April 1944; Address by General Montgomery to the General Officers of the Four Field Armies on 15 May 1944 (notes). Photostatic reproduction of the originals, including General Montgomery's penciled alterations, furnished the author by the Historical Section, Cabinet Office. 24. Bradley, A Soldier's Story, p. 326. 25. For General Montgomery's intentions, see Montgomery, Normandy to the Baltic, pp. 118-24, and de Guingand, Operation Victory, pp. 392-400. British views were obtained in interviews with Montgomery's G-2 and G-3 and with the commander of the Second British Army. For General Bradley's views, see his A Soldier's Story, pp. 316-18 and 325-26. 26. Eisenhower to Montgomery, 7 Jul 44, SHAEF SGS 381 OVERLORD, I(a). 27. Montgomery to Eisenhower, M-508, 8 Jul 44, SHAEF SGS 381 OVERLORD, I(a). 28. Montgomery, Normandy to the Baltic, pp. 114-18; Stacey, The Canadian Army, pp. 188-90. 29. Harris, Bomber Offensive, p. 211; Montgomery, Normandy to the Baltic, pp. 117-18. It is not clear what the forecast was which led to the decision to bomb on the evening of 7 July instead of on the morning of 8 July. The weather forecast for the night of 7-8 July was: ". . . good clear areas in France. Much cumulus and nimbocumulus at Nantes, little cloud at Paris." Operation Record Book, Appendices Bomber Command Operations, Vol. 4, 4 Jul 44, 11M/Al/5A, AHB - Night Raid Report Book 654. As early as 6 July, the air forces had been told that an appreciable air effort would probably be required on the evening of 7 July. Extract from Advanced Operational Book of Allied Expeditionary Air Force, 6 July 1944, p. 9. This extract and extracts from the report cited above are in OCMH. 30. Montgomery to Eisenhower, M-508, 8 Jul 44, SHAEF SGS 381 OVERLORD, I(a). 31. 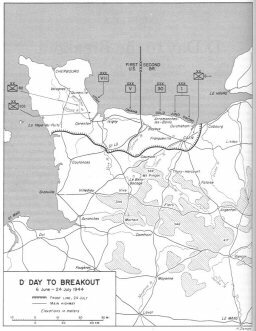 Montgomery's statement and the assignment of three armored divisions to the GOODWOOD attack led even some members of the 21 Army Group staff to believe that a deep and rapid penetration on the eastern flank was intended. 32. Montgomery to army comdrs, M-510, 10 Jul 44, First U.S. Army files (21 A Gp dirs). 33. Dempsey to author, 12 Mar 47; Williams to author, 1 Aug 51; de Guingand, Operation Victory pp. 401-03; Montgomery to Eisenhower, M-49, 12 Jul 44, Eisenhower personal file. 34. Eisenhower to Montgomery, S-55476, 13 Jul 44; Montgomery to Tedder, M-53, 14 Jul 44; Eisenhower to Montgomery, 14 Jul 44. All in Eisenhower personal file. Tedder to Montgomery, 13 Jul 44, SHAEF SGS 381 OVERLORD, I(a). 35. A British reviewer of this chapter has noted that General Bradley would not accept cratering and "torn-down buildings" but would have liked to have the support of Bomber Command. British heavy bombers, he adds, were excluded from the support program because for some technical reason they could not carry the necessary small bombs. The author's purpose in contrasting the tonnages dropped is not to imply lack of British air support for COBRA, but rather to note the importance attached to air support for GOODWOOD. 36. Leigh-Mallory Despatch, p. 64. Harris, Bomber Offensive, p. 212, cites the tonnage at Caen as 6,800. Stacey, The Canadian Army, p. 189, uses Leigh-Mallory's figure. 37. Montgomery, Normandy to the Baltic, pp. 127-34; Stacey, The Canadian Army, pp. 188-90. See also Craven and Cate, The Army Air Forces in World War II, III, 207-09. 38. New York Times dispatches, July 17-25, 1944. 39. Butcher, My Three Years With Eisenhower, pp. 617-24, makes clear the strong feeling which existed at SHAEF during this period on the matter of Caen. The information has been checked by interviews with nearly every key member of SHAEF and by examination of private papers and diaries. See Crusade in Europe, pp. 266-68, for General Eisenhower's postwar reaction. 40. Eisenhower to Montgomery, 21 Jul 44, Eisenhower personal file. 41. Montgomery to Bradley, Dempsey, and others, M-512, 21 Jul 44, 12 A Gp files 371.3 Military Objectives. Montgomery to Eisenhower, M-65, 22 Jul 44; Eisenhower to Montgomery, 23 Jul 44. Both in Eisenhower personal file. 42. Eisenhower to Surles, FWD 12498, 30 Jul 44. Eisenhower personal file.